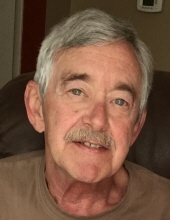 CONOVER, Thaddeus Sidney III - age 64, of Fenton, died Monday, February 4, 2019 surrounded by his family. Funeral Mass will be celebrated 11 AM Saturday, February 9, 2019 at St. John the Evangelist Catholic Church, 600 N. Adelaide St., Fenton with Rev. Fr. Robert Copeland celebrant. Interment will follow at St. John Cemetery. Visitation will be held 2 PM-4 PM and 6 PM-8 PM Friday at Sharp Funeral Homes, Fenton Chapel, 1000 W. Silver Lake Rd., Fenton where a scripture service will be held at 7 PM. Visitation will also be held from 10 AM-11 AM Saturday at the church. Thad was born May 20, 1954 in Flint, the son of Dr. McClellan Berston and Eileen Marie (Hand) Conover. He attended Flint Central High School and was a Master Mechanic. Thad married Marcia Morea on July 21, 1979. He loved skiing, boating, and NASCAR. Surviving are: wife, Marcia of Fenton; three children, Melani (Marc) Loria of Fenton, Jon (Gwen) Conover of Las Vegas, NV and Colleen Conover and fiancé, David Peterson of Fenton; eight grandchildren, Alyssa, Joe, Dom, Vince, Isaac, Carson, Grace, and Gabi; one great-grandchild, Atticus; sister, Cathy Baker of Hartland; many nieces and nephews. He was preceded in death by: his parents; and brother, Mac Conover. Tributes may be shared at www.sharpfuneralhomes.com. To send flowers or a remembrance gift to the family of Thaddeus Sidney Conover III, please visit our Tribute Store. "Email Address" would like to share the life celebration of Thaddeus Sidney Conover III. Click on the "link" to go to share a favorite memory or leave a condolence message for the family.